Hello Everyone! I am having a wonderful week! My sister in law came to visit and H&M just opened their second location in Houston, TX. YAY! So I’m going to take a nice long shopping trip to H&M and I hope to score some great finds. 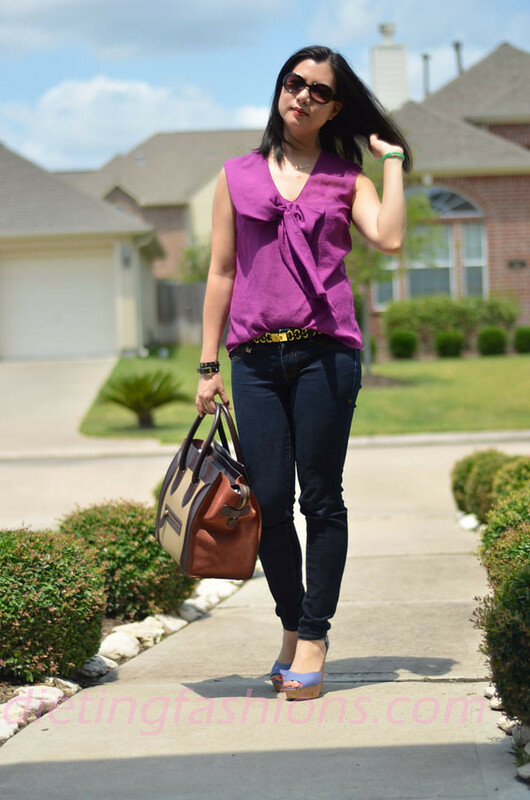 This blouse was purchase from Ann Taylor Loft and is one of my favorite shirts from that season. The makeshift bow is something I rarely see and it’s so cute. After losing the baby weight, I felt better physically and this blouse was one of the first ones I purchased after the weight loss. I’m not sure if the weight gain contributed to my health decline or it could have been stress from the new baby. There were nights I could not fall asleep. My back ached no matter how firm the mattress was. During the day, my upper shoulders and neck were stiff and knotted. Massages and therapy only alleviated the symptoms, which always came back. I am so much better now. I’m back at the gym doing strength training and that part really helps my back. Fabulous pairing! Love the purple color and the neck tie.. the Celine is yummy too! Thanks for stopping by! 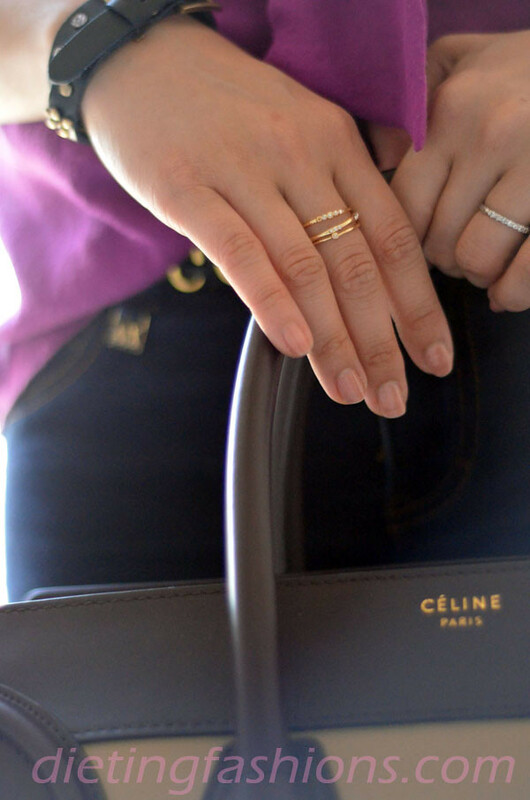 The Celine is my favorite purchase this summer! The purple top is pretty. I’m glad that your back doesn’t hurt as much before. I don’t know it it because I’m getting older or because I have a desk job but my back aches more than usual too. I’m sorry you’re having back pains too. I too wonder if it’s because of having a desk job. Helen, Glad to hear about the new H&M and I look forward to seeing your finds! Sorry about the pain, hope going to the gym continues to make you feel better. Love your little rings. I’m always on the looking for rings to fit my small fingers. I can’t believe they’re LC- never would have guessed.